Shark at Lennox Head according to Dorsal. Thought it would be bigger news if there wasn’t one. There's a story in today's paper about shark 28. The internet only has old stories but they're still interesting. Today's story has him ranging from Ballina to Maggie River. And in a twist, there's a story on the opposite page about shearers. He's doing a top job on his goat there! Woman attacked at Cid Harbour in the Whitsundays. We spent a few nights there. Of all the places up there, it has the sharkiest feel. Waters a bit murky and it is a bit deeper than most anchorage’s. We weren’t really comfortable swimming there. I think a lot of people throw food scraps off their boats too. When I lived in Newie my girlfriend and I went up there with another couple one weekend. We were all hanging in the bollocky at Samurai. We left the other couple and climbed up the big sand dune behind the beach. Came around a corner and found this naked guy Perving down at our friends and polishing the baseball bat furiously. He totally lost it and ran away. We cracked up. Bodyboarder attacked near Mandurah. Extensive foot and ankle injuries. Seems to be one or two around NSW atm. Receiver pings in last 24 hours at, Old Bar, Hawkes Nest, Evans Head, Redhead, Park Beach, Crescent, Port, Forster, SWR. Well, to expand on the obvious....most critters get frisky and start breeding in the spring. 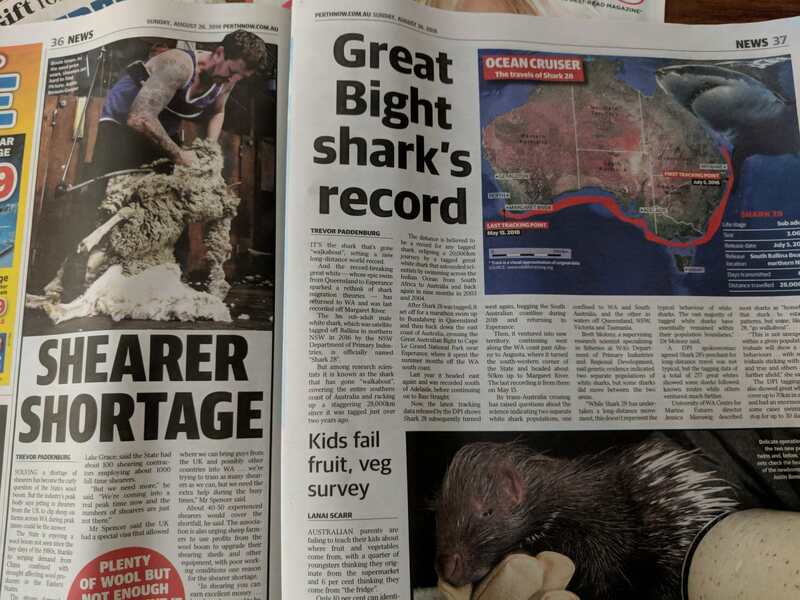 Contrary to a certain well known surf journalist and real surf members disdain Marine studies by the West Australian Government have found a greater risk of Great White attack in Winter and Spring due to cooler water temps which they prefer. Very contested findings Beany and totally contrary to the data from the east coast. DPI advise 3.52 m White Shark tagged and released from SMART drumline at SOUTH BALLINA, Ballina at 07:30 pm on 16 Nov 2018. Water temp well over 20 at the moment.